Posted on 20, January 2016 by EuropaWire PR Editors | This entry was posted in Business, Education, United Kingdom and tagged Britain’s top 100 employers, Stuart Johnson, University of Bristol. Bookmark the permalink. A major new report out today [18 January] has revealed that students at the University of Bristol are among the most targeted by Britain’s top 100 employers. Bristol has been ranked ahead of Oxford and Cambridge at 4th in the table, which was compiled as part of the ‘Graduate Market in 2016’ study. BRISTOL, 20-Jan-2016 — /EuropaWire/ — The study, conducted by High Fliers Research in December, looked at graduate vacancies, starting salaries and undergraduate work experience programmes at the country’s 100 leading employers. Among the companies on this list of leading employers are the BBC, Google, Apple, Amazon, the Bank of England, Marks and Spencer and Dyson. Stuart Johnson, Director of Careers Service at the University of Bristol, said: “Bristol has for a long time been a university heavily targeted by top employers but it is particularly gratifying to be at our highest position in the report since High Fliers began their Graduate Market Review in 2004. The report confirmed that that top 10 universities most-often targeted by Britain’s top graduate employers in 2015-2016 are: Manchester, Nottingham, Warwick, Bristol, Cambridge, Oxford, University College London, Durham, Bath and Leeds. These institutions have attracted the largest number of top graduate recruiters for campus fairs, recruitment presentations or other local university promotions during 2015-2016. A full copy of the report can be downloaded from the High Fliers website. 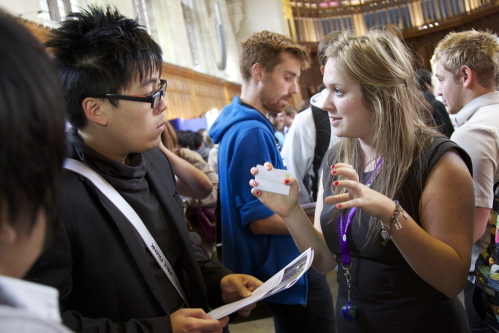 The Careers Service at the University of Bristol has a large events programme, with workshops covering essential topics such as networking, assessment centres and job applications. Careers staff are available to provide feedback on students’ CVs, practice interviews and careers guidance. Its relationships with employers are extremely important, and staff work hard to offer students a variety of opportunities to engage with a wide range of sectors; through presentations, interactive skills sessions, careers fairs and practice interviews. Business Basecamp offers a start-up support service to students who are starting their own business or enterprise. Additional support is available from Bristol alumni through the Careers Network and Careers Alumni Mentoring Scheme. The Careers Service works with employers to offer the Bristol PLUS Award, recognising that a variety of skills and experience gained in addition to your academic studies is essential to be competitive in the graduate labour market.